Iran and Saudi Arabia tensions could derail Syria talks. 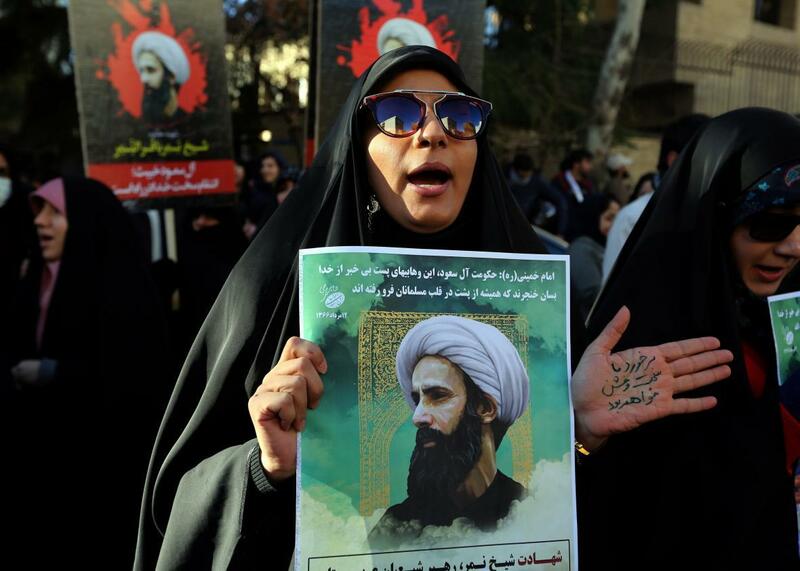 An Iranian woman holds a portrait of prominent Shiite Muslim cleric Nimr al-Nimr during a demonstration against his execution by Saudi authorities on Jan. 3, 2016. U.S. officials are worried about how this week’s rising Saudi-Iranian tensions will impact the fight against ISIS and the tenuous Syrian peace process—and they should be. The only reason for any sort of optimism about the process to end the nearly 5-year-old conflict was that Saudi Arabia, the region’s pre-eminent Sunni power and a major backer of the Syrian rebellions, and Iran, the region’s pre-eminent Shiite power and a major backer of the Assad regime, had both agreed to come to the table. Now what? U.N. peace talks bringing together Syria’s warring parties are due to convene on Jan. 25. The killing of the leader of one of the largest Syrian rebel factions by either a Syrian or Russian airstrike last month had already threatened to derail the fragile process. With Riyadh and Tehran now at each other’s throats, it will take a herculean diplomatic effort to get talks back on track. From a U.S. perspective, the current round of tension looks stunningly unnecessary and shortsighted given the larger issues at stake in the region. According to leaked documents obtained by the Independent, Saudi Arabia executed prominent Shiite cleric Nimr al-Nimr and 46 other people knowing full well that it would provoke angry protests abroad. Iran, for once, might have had international public opinion on its side, at least until hard-line protesters ransacked and burned the Saudi embassy in Tehran. As the Guardian’s Saeed Kamali Dehghan writes, “This was the moment when Iran could have argued that Saudis were to blame for the growing sectarianism in the region, but instead it scored an own goal.” Even Iran’s ally Russia condemned the storming of the embassy, which is pretty rich given the attack on the Turkish embassy in Moscow just last month. The Sunni-led governments of Bahrain, Sudan, and the United Arab Emirates have now all joined Saudi Arabia in taking diplomatic action against Iran. In the wake of the November Paris attacks, the French scholar Olivier Roy warned in the New York Times that while the U.S. and European countries may view the Syrian conflict and the resulting rise of ISIS as the most pressing problem in the Middle East, “the main actors in the Middle East deem other enemies to be more important.” As I wrote last month, there are a few cases where the threats and complications emanating from Syria have pressured rivals to overcome differences, but the region’s two key rivals—Iran and Saudi Arabia—still view each other as a bigger threat than ISIS. Iranian conservatives, meanwhile, were already alarmed at the prospect of a peace process in Syria involving Saudi-backed rebels that could lead to the removal of pro-Iranian President Bashar al-Assad. The weekend’s demonstration of defiance was probably deemed worth the risk of blowing up the peace process because conservatives are wary of the peace process to begin with. The nationalist fervor unleashed on both sides may benefit both governments in the short term. Unfortunately the people of Syria—as well as Yemen, where Saudi Arabia just ended a short-lived cease-fire with the Shiite Houthi rebels—are sure to suffer as a result.